I think I've finally reached critical mass. No, not the critical mass needed for a sustained nuclear chain reaction. A critical mass of tools. I was reading Ferenc Mate's The Finely Fitted Yacht this morning. This is a book that describes 200 small wood working projects for boat owners, from "Sink Board with Drain Tray" to "The Finely Fitted Fan". About half-way through my melon, I realized I had enough hand tools to build just about anything in the book. That was a pretty cool feeling. Particularly for someone who's tool collection a few short months ago was meager, presuming I could even find them. Thank you Roger, for turning me onto the idea that old tools could be found for less than new tools, and to the Galoots on the Old Tools forum, for getting me the rest of the way there. If you're at all interested in hand tools, particularly the good old tools, it's worth subscribing. A great bunch of guys. Well, on this Day 17, my mission was to mount Cabin Boy's transom, using the micro invention described yesterday, and to tie the whole backbone together, as much as possible. I started by bolting the keelson to the stem. To do that, I had to drill a long 1/4" hole through the keelson and the stem, and then chisel out a 'landing area' on the stem for the washer and nut. For some reason, I still find it difficult to drill or cut 'real wood'... i.e., the wood that will end up in the actual boat. There is something so final about drilling a hole, or -- worse -- making a saw cut. How can you ever know if you are doing it correctly? What if you make a mistake??? That's the beauty of having a deadline. I hesitated, as usual, and then thought, "Well, if it's wrong, it's wrong", and pulled the trigger. The 'landing area' on the inside of the stem for the keelson bolt. Of course, I didn't make a mistake, and did a fabulous job of chiseling out a nice flat spot for the nut, if I do say so myself. One funny thing... every time I drill into White Oak, it smokes. I have a variable speed drill and try to take it easy, but it smokes every time. This time, I got so concerned about the health of my drill bit, that I had a cup of water close at hand, and dipped the drill bit into the water frequently, too cool it down. I was worried about the drill bit getting too hot and losing it's "temper". Obviously, I've been reading too many old tool books. Can any one tell me if it's possible for a drill bit to loose it's temper? I felt a bit silly bathing it every few seconds, so if I can avoid this procedure in the future, that would be a good thing. If you know the answer to this question, please leave a comment below or drop me a line at john (at) unlikelyboatbuilder (dot) com. So here is the stem and keelson bolted loosely together. Before the final assembly, I'll put some bedding compound in the joint, to make it water tight. Next, it was time to trim the keelson to size, so I could mount the transom in the stern. The cut below had to be in the right place (the length taken right off the lofting board), and at the right angle so it would cozy up to the inside face of the transom. Again, this angle comes right off the lofting board. I felt a bit odd making this cut by eye... I'm sure the Boat Building Industrial Complex has a special tool for this, but I have no idea what it is. My Japanese pull saw -- assisted by my eye -- made a nice clean job of it. I'm continually impressed by how easy it is to make a straight cut with one of these tools. Its definitely going in my desert island took kit. 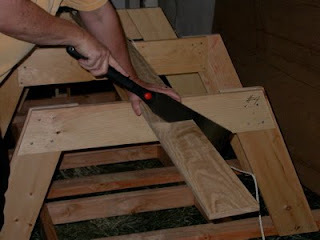 With the tail end of the keelson out of the way, it was time to mount the transom, using the dual clothespin technique. 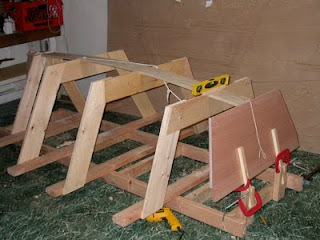 In a nutshell, there are two clothespin clamps bolted to the ladder frame. These are beyond Station 'S', which is at the inside side of the final 2x4 cross member. There are also two 'beams' that are clamped to the outside of the transom. I had to move them from the inside (yesterday's picture), to the outside, to make the top of the transom line up with Station 'S'. The key point here is that everything is adjustable. I can move the transom right or left, by losening the 'beam' clamps. 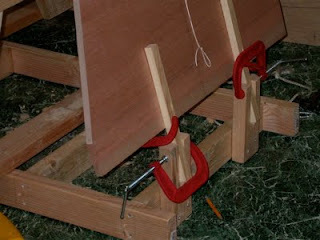 I can move the transom up or down, or forward or back, or change the angle, by loseing the clothespin clamps. In other words, with a bit of patience, it's possible to get the transom into exactly the right position, and then to clamp it tight. 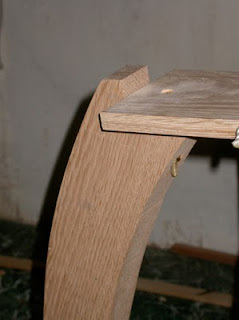 It does the same thing a fixed jig would do, without the precise lofting and patterning it would take to get a fixed jig right. Still, if I had more time, I'd probably take the time to build the jig. It would probably be a tad more precise. Here's a close up of all the moving parts. 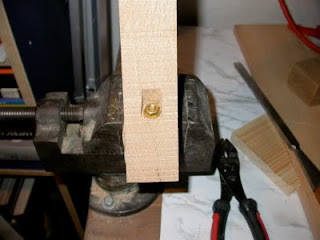 The clothespins are screwed to the frame, everything else is just clamped. That's what makes it adjustable. This little invention does prove one thing, though: you can never have too many clamps! Well, that was it for Day 17. Tomorrow I will be lining off the hull! Your comment about cutting wood made me reminisce. First boat I worked on the shipwright asked me to help lay out the cut for joining the keel to the stem. Keel was a 30 foot white oak 6 x 8 and we had just spent a week hand planing it flat and square and setting it up level. After we marked it out, he asked if I had brought my handsaws. I told him I was a bit too nervous to make such a cut. His response: "What's your problem? It's only wood, it grows on trees." Then he walked away. I think of that moment every time I face a difficult cut. Smoke happens when either the bit is too dull to grab, or the speed is to high to let the bit garb. The queasiness about making a cut lingers a long time. Congrats on the progress. Keep a can of Butcher's wax handy and dip the bit in the wax before and during. No smoke, no binding. Years of experience taught me this. Check out: http://www.sailinganarchy.com/ scroll down to Soul Man to see where I learned this. It's funny how many people have written to say they still get that feeling when they make a cut. Good to know it's not just me! John, thanks for the tip on Butcher's wax. Sounds like a great idea. It most definitely is possible to overheat and ruin a drill bit. What kind of bit are you using? And are you drilling into end grain? Make sure you're using a good quality bit and it's sharp. You know how you get over that feeling? By messing up a bunch of times and fixing it. You get over it by becoming confident that you will be able to fix it and that the boat will still be okay. You learn over time that almost nobody notices the mistakes that you as a builder know are there. It is also in my opinion one of the reasons why the absolutely most beautiful examples of craftsmanship at shows come from amateurs. They demand perfection of themselves; and will redo an item that's messed up. If something is your hobby, time invested is NOT an issue; after all most people have hobbies to fill any spare time. As a professional you HAVE to accept that good enough is good enough or your family starves. Check out your next craft show wheter it's boats or any other craft. The most beautiful work will be made by some retired guy who spend a few thousand hours making an absolute gorgeous piece of art. Hajo, that's very true. If I spent that much time on a small boat, I'd keep it in my living room on display. I certainly wouldn't want to dunk it in salt water. Well, I won't have that problem with Cabin Boy. As long as he floats, I'll be happy. Bill, I guess with the hole I had to drill in the stem that I was drilling into the grain, since the grain runs up and down the stem. I tried both a twist bit and a spade bit. Both smoked. I think the main problem is too much speed from the hand drill, even though I was running at low speed. Still a lot higher than with a brace. I'm going to have to get a brace... I seem to have problems with power tools.